It took approximately 300 years from 1500 to 1800 for European population to extend from the East Coast of America to the Mississippi River. Popular wisdom at the beginning of the 19th century hypothesized it would take at least another 300 years, or most likely longer, to fill the area between the Mississippi and the Pacific coast. Of course, it didn't take 300 years to settle the West. A number of factors accelerated the pace of change. Beginning with the Louisiana Purchase in 1803, the US government acquired domain over the land to the west of the Mississippi through war, treaty or purchase. The discovery of gold in California and the promise of fertile land lured an estimated 300,000 to the Pacific Coast prior to 1860. In the midst of the Civil War, Congress enacted the Homestead Act entitling any head of family, anyone over the age of 21, or any veteran of military service to 160 acres of land. With the end of the war, many took advantage of the offer filling the westward trails with wagon trains loaded with all their worldly possessions. Before the end of the century America's frontier had been extended to the Pacific and then officially declared closed. The decision to make the trek could not have been an easy one - motivated no doubt by hard times at home and the promise of better times to the west. Sarah Raymond was one of those who made the journey along with her father, mother and brothers. Her diary doesn't reveal her age, but we can assume she was young, probably a teenager. The family began their journey on May 1, 1865 in Missouri and arrived at their destination in Virginia City, Montana Territory on September 6. Sarah details each day's adventures - accidents, sickness, river crossings, Indian encounters, mud, dust, monotony, and terror. We don't know much about Sarah beyond what appears in her journal except that she married and stayed in Virginia City the rest of her life. She first published her journal at the request of friends in a local newspaper, the "Rocky Mountain Husbandman," in the early 1880s. Her diary was published in book form in 1902. We stood by the graves of eleven men that were killed last August by the Indians. There was a sort of bulletin-board about midway and at the foot of the graves stating the circumstances of the frightful tragedy. They were a party of fourteen, twelve men and two women, wives of two of the men. They were camped on Plum Creek, a short distance from where the graves are. They were all at breakfast except one man who had gone to the creek for water, he hid in the brush, or there would have been none to tell the tale of the massacre. There had been no depredations committed on this road all Summer, and emigrants had become careless and traveled in small parties. They did not suspect that an Indian was near until they were surrounded, and the slaughter had commenced. All the men were killed and scalped, and the women taken prisoners. They took what they wanted of the provisions burned the wagons and ran off with the horses. The one man that escaped went with all haste to the nearest station for help. The soldiers pursued the Indians, had a fight with them and rescued the women. 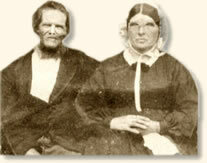 One of them had seen her husband killed and scalped and was insane when rescued and died at the station. The other woman was the wife of the man that escaped. They were from St. Joe, Missouri." Just after we crossed the bridge, and where there is a sudden turn in the road, as it winds around the mountain, we saw where two men had been killed and two wagons burned last week. The tire became loose on a wheel of the next to the last wagon in a freight train, the men stopped to tighten it, while the rest of the train moved on, not thinking of danger, and was out of sight in a few minutes. An hour later some of the men came back to see what kept them. There they were - dead and scalped - horses gone, and wagons on fire. The Indians had taken all the freight they could use, piled wood under the wagons, and set it on fire. We saw quantities of white beans scattered over the ground, also the irons from the wagons." ...I did not awake this morning until everything was ready for a very early start. Mother had kept my breakfast warm by keeping the stove until the last minute. I sat in the wagon and ate my breakfast after the train had started. When through, I climbed out and went to see how Neelie [Sarah's friend] was. I found her feverish and restless; her symptoms unfavorable. Oh, the dust, the dust; it is terrible. I have never seen it half as bad; it seems to be almost knee-deep in places. We came twenty miles without stopping, and then camped for the night. We are near a fine spring of most excellent water - Barrel Spring it is called. I do not know why; there are no barrels there. When we stopped, the boys' faces were a sight; they were covered with all the dust that could stick on. One could just see the apertures where eyes, nose and mouth were through the dust; their appearance was frightful. How glad we all are to have plenty of clear cold water to wash away the dust." No doubt Frasier was honest in his advice, and would have invested in flour for himself. He charged more freight than was right, for ten and twelve cents is the prevailing price; but then Hosstetter should have found that out himself. It was getting dark, and Fraser stood with one hand on a wheel as he talked. He then got into the wagon and out again, with something in his hand, which Hosstetter thought was a revolver in the gathering darkness. He came back to the wheel where he had been standing when he made the threat, and Hosstetter thought he had come to shoot him, and fired twice, as he thought, to save his own life, Frasier fell, shot through the brain, and died instantly. Then it was found he had a hatchet in his hand and had come to tighten a tire on the wheel, which he had found loose when he laid his hand on it. Frasier's eldest son of fourteen years is here. There are five children and their mother at home. Hossteter has three children and a wife. Eleven innocent persons to suffer, no one knows how intensely, for that rash act. Frasier's son knelt beside his father's dead body and placing his hand on his breast, he swore a fearful oath that he would have but one purpose in life until his father's death is avenged. Oh, what a shocking ambition for so young a boy." "...The men from these four trains elected judge, jury, prosecuting attorney and lawyer for the defense, and have tried Hosstetter for murder. The jury brought in a verdict of 'Not guilty.' He shot in self-defense, as Frasier had threatened to kill him." Sarah's diary entry a day later notes that a squad of soldiers came and took Hosstetter to a fort near Green River (Wyoming) for an official trial. However, she does not reveal the outcome of that trial. 'I'll risk it.' And he rode in below where the ditches were dug. The pony's feet were not muddy. Hillhouse found we could easily ford he creek below the ditches, which we did without accident. The Missourians refused to pay the exorbitant price, and offered them fifty cents per wagon. They swore they would not take a cent less than one dollar. But the travelers were too many for them, and they drove over and did not pay a cent. The toll men were fearfully angry, and made great threats, but the men dared them to do their worst and laughed at them. Herndon, Sarah Raymond, Days On The Road (1902). "Crossing the Plains, 1865," EyeWitness to History, www.eyewitnesstohistory.com (1999).